BRCA1 and BRCA2 (BRCA1/2) mutations account for most (though not all) cases of inherited breast cancer in women. These mutations are also associated with an increased risk for ovarian cancer. 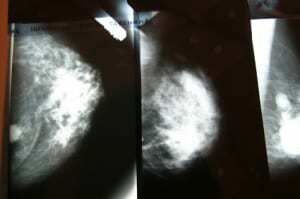 In men, BRCA1/2 mutations increase the risk for breast cancer and may also increase prostate cancer risk. Research has indicated there may also be an increased risk of melanoma and pancreatic cancer in people with BRCA1/2 mutations. Although BRCA1/2 mutations significantly increase the risk of cancer, having one of these mutations doesn’t mean a person actually has cancer or will necessarily ever get the disease. But new research from scientists at the National Cancer Institute and the National Human Genome Research Institute, published online this week in the journal PLoS ONE, suggests that those BRCA1/2 carriers who do escape cancer may still be at risk of a shorter than average lifespan. In a study of almost 5,300 people with Ashkenazi Jewish ancestry researchers found that, on average, both men and women who carry BRCA1/2 mutations die younger — even when cancer deaths are excluded from the analysis. Among women free of melanoma, breast, ovarian and pancreatic cancer, BRCA1/2 mutation carriers died 5.8 years earlier (age 75.0 vs. 80.5) than those women without the mutations. In men, after excluding cases of melanoma, prostate and pancreatic cancer, BRCA1/2 mutation carriers died about 3.7 years earlier than those without the mutations (71.0 years old vs. 74.7). “Theoretically, these mutations may either be associated with a small increase in risk of a variety of different diseases, or they may be associated with moderate increase in risk of a few major diseases,” the authors write. They note that the current study is unable to make this distinction because it did not collect information on non-cancer related causes of death. The researchers analyzed the effects of only the three BRCA mutations that are most common in Ashkenazi Jewish people: 185delAG in BRCA1, 5382insC in BRCA1, and 6174delT in BRCA2. The mutations account for 80-90% of hereditary breast and ovarian cancer in this ethnic group. But there are hundreds of other BRCA1/2 mutations that have been associated with cancer, and the authors caution that further studies taking these other BRCA1/2 mutations into account and using study subjects from diverse groups will be needed to confirm their results. The authors conclude that understanding the effects of BRCA1/2 mutations on non-cancer related deaths could eventually help scientists understand how the mutations affect cancer risk and may even facilitate efforts aimed at finding new ways of preventing disease in BRCA1/2 mutation carriers.